UXGA with LED Backlight ex-factory! On earlier LED-mods remove the Inverter-TRAFO! AVOID burnt-out inverters! Click here to see HOW! Soup up your (15" only) T60/R60/R61 Thinkpads! See an experiment here: The first (AFAIK) T43p with a LED-lit AFFS UXGA LCD. Here is a big whopper: The ultimate* 4:3 FrankenPad...brace yourself...HUGE pics. And the one to beat them all: The FINAL 4:3 cut...meet The Nuclear FrankenPad...HUGE pics. Just look at the difference between screens with a LED backlight and screens with a CCFL backlight! 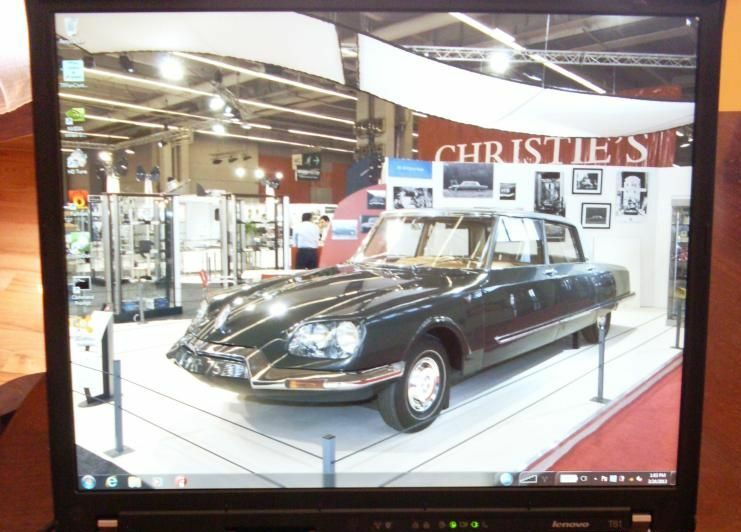 Now there are BoeHydis Flexview IPS UXGA (1600x1200) screens available, that have ex-factory LED backlight! - Both have the same cable connector, but the 'new' connector has been mounted 180° reversed compared to the 'old' one. - The connector wiring has also been reversed (i.e. 'old' pin 1 is 'new' pin 30, 'old' pin 2 is 'new' pin 29. etc. Have fun! the 'new' connector sits 10mm (0.39in) lower than the old one. - This ONLY works properly on 15" 4:3 T60/T60p/R60/R60e/R61 laptops. NO others will be done! This means that your old setup no longer fits: it will require major modification. I have seen where people removed the connector from the new LCD panel, and replaced it with a connector from a 'standard' screen. This requires an expensive Rework Station, as well as the knowledge to work with it. Not everybody has such a spare connector, let alone a Rework Station! Others have painstakingly soldered wire for wire (30 of them!) onto the LCD. Not for the unitiated! New on this screen also is the appearance of the LED-wiring, which uses a rather uncommon 14-pin connector. The solutions I have seen so far involve removal of this connector, and soldering wires directly onto the LCD's circuit board. Again, not everybody's cup of tea! The inverter also needs to be modified, to enable Backlight On/Off as well as Backlight Dimming (using Fn/Home and Fn/End). Instead of trying a messy soldering job with too many chances of errors or failure, I spent a lot of time and money into research. (and destroyed a few LCDs and inverters along the way...). The result of my efforts was a neat wiring harness for this new screen, which avoids the messy soldering onto the LCD! The LCD-cable was modified using an LCD Cable Extension which at the time was only available in the Far East. This extension went out of production, and was then replaced by an utterly useless (and wrong) look-alike. Due to the inferior quality of this replacement, I had to give up doing LED-mods alltogether. After some more experimenting, I have now refined a useful method to do the LED-mods again! And of course I still use the special 14-pin cables for the Inverter-to-LED-socket connection. your LCD-cable plus an approved inverter! You will have to mount these yourself into your laptop! These LED-screens are too rare and expensive nowadays to take any shipping risks! I do NOT sell any LED-LCDs, inverters, or LCD-cables! So please make sure you ONLY send the above LCD-cables or inverters for a LED-mod! And for those of you who would like to see how a T60 LCD is replaced, check this ifixit link. How much, you want to know? NOTE: shipping costs are the same for up to THREE LED-mods. Shipping to USA will be via USPS in a Small Flat Rate Box, with Tracking. Shipping to Any other destination will be via USPS in a First Class International Package, with Tracking. Please note that you can no longer ship LED-screens to me. As of immediately I will ONLY do the LED-mod on the LCD-cable and inverter. YOU will have to do the assembly of the lid yourself! Please note: I do NOT sell screens, cables or inverters separately! No exceptions! Turnaround time is ca. 5 business days.